Well, I have been meaning to write about Frog for sometime now. 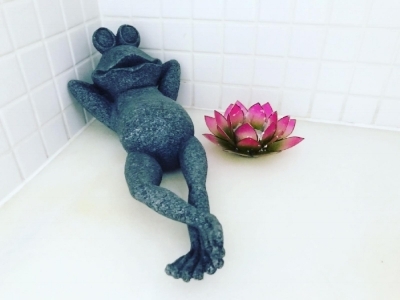 He sits in our shower, 'chillaxing' and doing his thing. Without fail, he makes me smile every single day. We first saw him when holidaying in the beautiful Alaçatı, Turkey. He was chilling by the pool, living a good life. Graham and I loved him because he made us chuckle whenever we walked by. So imagine Graham’s excitement when two weeks later we stumbled across the same figurine in a shop in Ankara. “Let’s get him!” Graham said. Insert well-deserved eye rolls. But truth is, those were my reasons, and recognising that made me ask one more thing..
Too cheap/silly/nonsensical/not stylish enough FOR WHOM?! Because ultimately the only thing that truly matters for our home is that Graham and I love it. I realise this perhaps seems a little dramatic for an amphibian mould but I feel it's quite metaphorical, so indulge me a little. When we make choices about how we dress our homes, our bodies, our children, WHO ARE WE DRESSING THEM FOR??!!!! Whose approval are we seeking above our own? What mould are we trying to distort and squeeze our unique selves and lives into so that we 'fit'? Are we compromising on things we love and things that bring us joy because of what we fear/assume/predict others may think? Well what a load of rubbish that is. Thankfully we bought the frog. And every single day, without fail, I am SO glad we did! And to you guys - what’s something that you unapologetically love that perhaps others don’t? I would so love to know so please comment away. Oh and by the by, this is Bull Dog. He often wears our reading glasses at night and he has a very similar story to Frog.